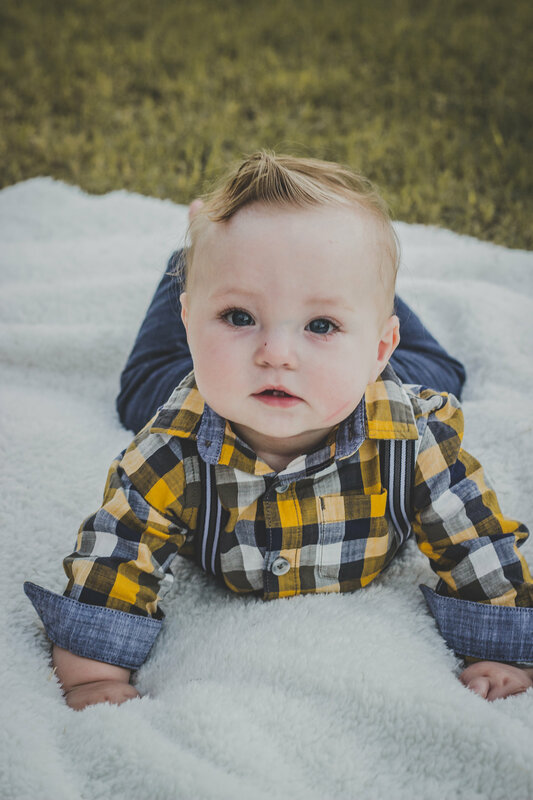 Wyatt Edward Smith passed away quietly and unexpectedly the morning of May 9, 2017 at 13 months of age. He was found peacefully resting in his home in Gilbert, Arizona. He is survived by his parents, Warren and Amber Smith, and his two older sisters, Leah and Abigail Smith. He had recently celebrated his 1 year birthday. He had mastered a quick crawl and loved exploring and playing. He could pull himself up and was well on his way to cruising and walking. His favorite toys included a toy airplane and his sister’s dollhouses, albeit pink, they had doors and windows he could open and slam shut. His personality was gentle and sensitive. He showed his bashful demeanor when anyone other than his mother would speak directly to him. He was a momma’s boy that loved to say “da-da”. His smile was charming and captivating. He had bright sky-blue eyes and the longest lashes. He was happy, patient, and obedient. Wyatt will be missed by his great grandpa, grandparents, aunts, uncles, cousins, and loving friends. We miss our sweet little angel boy and anxiously await our reunion with him. Funeral services will be held on Friday, May 19, 2017, at 10 AM, at The Church of Jesus Christ of Latter-day Saints Chapel, 4629 E. Guadalupe Rd, Gilbert, AZ, 85236. We are heartbroken to hear of the passing of this sweet angel, my nephew. We love you Amber and Warren, and pray for strength for you and your family. I know that Wyatt is in a peaceful and happy place. I am so thankful for the Atonement of Jesus Christ and the knowledge that families can be together forever. We’re so sorry about the passing of your little son. What beautiful pictures of him you’ve shared. We love you. Sending love and prayers from the family in West Virgina. We love you all so much. We miss Wyatt so much, and send all our love, support, and prayers. We are so sorry to hear about the passing of your sweet little boy. His picture is adorable. Our hearts hurt for you. Clear from Burkina Faso, we send our love and prayers to you. We love you! Our prayers are with you and your family. May our Lord and Savior comfort you and your family during this time. Amber and Warren, I am so sorry. I’ve recently had a lot of people pass away that we’re close to me and each time I have to relearn that this life is so preciously short and unexpected. You will definitely be with your sweet Wyatt again, and it’s helpful to know that your little boy was so loved, even in Heaven, that they couldn’t bear to be away from him any longer. You are incredible parents and he was so lucky to have you two! I wish you so much love and comfort!